Client works in current wine staging, doesn't work with Gallium-nine. Game itself doesn't launch, seemingly since a patch a month ago (Based on this reddit post). As far as I could find, the game does not currently run. Game itself as it doesn't launch. Here's the solution to install it. just watch this video and follow the instructions. U'll have to use POL and configurate Wine! What is the list of the component to install for the new client to install successfully ? Do new client work in a 64 bits wineprefix ? Do I need to set OS to something else than windows xp ? Hello. 64 prefix works as 32 prefix too. You need to set msvcp140 as "native, then builtin" into winecfg for your wine's league prefix. I don't know if msvcp140 comes by default to set in winecfg. If not, install vcrun2015 with winetricks for your prefix, and then go to winecfg and remove all the stuff that vcrun2015 set into, except msvcp140. Note that to run the game you will have to try a few times, it will crash sometimes, but when it runs you are good to go, it works perfect. Sorry I didnt read that you are trying to *install* the new client. What I told you is the steps for the new client to work. Actually, I don't know what you need for it to install, I installed it without problems just using my old configuration when i used the old client. Guys, this game isn't a platinum. Even following the directions here, getting this installed took forever and was utter hell. After finally getting it to run, the beta client runs like junk, and really just doesn't work. 1)The beta client (which we will all be forced to use in 2 days) doesn't start reliably. Sometimes I literally have to start up the client 5 times in a row dealing with unpredictable results. Bugsplats, sometimes it just won't open and closes immediately, and other times it will open to a black screen and sit there. 2)When the beta client does get started, it crashes unpredictably. Particularly if I get invited to a game by someone on my friend's list, soon after I join the game the beta client crashes with a bugsplat. I've tested this multiple times and it's fairly consistent. 3)Lastly, don't even think about playing this in DirectX mode. The guide should probably just say "play in openGL only". With DirectX the game straight up wouldn't load any assets. I get into the game but would be met with a black screen. I could click around and hear sound, but could see nothing. Until functionality with the new beta client is smoothed out, this really shouldn't be listed as a platinum. It's misleading and lets people think this will run flawlessly, which it doesn't come even close to that. P.S. The old client works very well. But, that's a moot point. In two days it will be gone forever. For me new client works great with just --no-sandbox argument, so i guess it just depends on individual setup. About DirectX: Did you install d3dx9_39 with winetricks? I didn't because the guide up top says not to. :( The weird thing is my setup really isn't special. It's just Ubuntu (latest version 16.something). But the game works well enough with openGL mode on... It's the beta Client that I'd like to work reliably. I seriously wonder if there's something I can do to fix how often it crashes. Ok, give us more information if you want help. -What wine version are you using? Staging or not staging? - What overrides have you got in winecfg? Which version of opengl library works with beta client? The workaround for the FPS drop in my computer is to limit the fps to 60 into the ingame's graphics options. I have found that that option only works if you disable the vertical sync. The only thing you need for the game with the new client to work with wine staging 2.4 is to go to winecfg and override "msvcp140" as native, then built-in. You don't need d3dx nor vcrun nor anything else. Although, it seems like running the game with OpenGL (setting the option x3d_platform=1 in the [General] settings of game.cfg), the performanace is better than running it with directx. In fact, if you try to run the new client with wine 2.4 and vcrun installed, it will crash. Also, enabling thje CSMT patches in winecfg seems to improve the performance. Maybe to be able to set msvcp140 in winecfg, first you have to install vcrun2015 with winetricks, and then go to winecfg and remove all libraries it has configured, then you can set the msvcp140 as native, built-in. I don't know because my wine prefix is not clean, maybe a clean wineprefix comes with msvcp140 by default. NEW CLIENT WORKING VERY FINE. Hello. I have tried again the new client on wine 2.0 and it is working very fine. You only need to install for it to work vcrun2015. I have also tried it with wine 1.8 and wine staging 2.1 and with both it is not working properly. I only manage to make it work perfectly under wine 2.0. RE: NEW CLIENT WORKING VERY FINE. Are you look my guide ? What distribution you use ? Frame rate (FPS) huge drop. Hello people. After minute 30-40 inside the game, the game has a brutal frame rate (FPS) drop, turning it unplayable. I have to kill the game and reconnect from the client. That way the frame rate increase again like at the start of the game. I have tried wine 2.0, wine-staging, OpenGL, DirectX, and found no solution. Please, if out there is someone who does not experiment this frame rate drops, sahre your configuration because there are a lot of people having this problem and we can't found a better workaround than restarting the game. RE: Frame rate (FPS) huge drop. It seems that if, inside the game you go to the graphic options and configure the game to lock the FPS to 60, it will not have the frame rate drops. I am still testing it bnut it seems to be solved. Try it and comment. hi people, i am new in linux/wine thinks. The installer is a pain in GNU/Linux. If you have the opportunity, use a computer with M$ Windows to copy the game folder into ubuntu. Sometimes can't login to PVP.net - any ideas? Since a few weeks now I sometimes can't login to PVP.net. When closing the app and logging in again, there is a chance that I come into game. If I am in the game, everything runs as intended. Sometimes it logs in at the first three tries, sometimes I need 10 tries. Any ideas? RE: Sometimes can't login to PVP.net - any ideas? Have you installed the following? May you please elaborate on what these might be the problem? I've installed them, but I've got a *sporadic* problem. I can login and if it happens, also play as intended. It just takes several tries to let the login happen. I always get logged in (authenticated), but sometimes the login process times out and gives me the error. 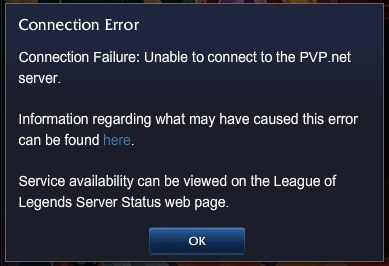 There is a common connection problem with LoL since version 4. Usually it was solvable by installing IE. Something in the net stack is sporadically causing issues. Can you check how many processes of LoL/RADSLauncher you have running when you encounter the bug? I've also seen this with a hanged process in the background. Oh, I remember having issues with wininet, may this be related with this issue? Just checked and saw that "wininet (builtin)" is being used. Mh, just checked... same error without wininet set. Ubuntu 16.04, my game run 60-35fps in wine 1.9.2-staging-LOL3 config enable CMST but after 10 - 20 min i have freeze for 10 sec (5-10fps). The frame rate drops off even without CMST, and also in newer versions. Lategame I end up with 5 fps, with CSMT or without, although I have 70 fps when the game starts. Go to in-game graphics options. Lock the FPS to 60. Enjoy the game without FPS drops. It works for me, if it works for you too, comment here with feedback please. Same here... Only "fix" I found was closing the game and reconnecting so that the game client reloads... That's a poor fix, but you can use it when you die in late game with long death timers. Or, y'know, whenever, just let your team know what you're doing. Black screen instead of Patcher, with sound(and video). Its even probably updating, but I cant see if it does. RE: Wine or system troubles? Setting the windows version to xp fixed this problem for me. Hi, I have a question... the beta clients works on ubuntu 16.04?? If you're willing to put some time into it you'll probably be able to get it work, yeah. Look through the other comments for more info. I started the beta client and in the logs (with WINEDEBUG=all) I see there is a problem creating a temporary file (from LoL's logs) and it was because there is an ACCESS_DENIED when create_file is called to create the file. This type of crap with the "/path/to/wine" in a guide needs to be removed from the linux community or at least only tolerated when an example is provided. I'm stuck because I can't type the correct path for my wine and winetricks which were both installed thanks to "sudo apt install winehq-staging winetricks" on a 64 bit ubuntu 16.04 so they're as standard as an install can possibly be yet noone in the linux world has ever thought of asking where stuff is installed. there's nothing on that topic on askubuntu or anywhere noone seems to know. I looked all over on my system myself I looked in .cache, in /usr/bin, in usr/share but I shouldn't be shooting in the dark!!! I should be getting straight on target. just say "it is standard in the latest debian-based OSes for it to be in /bla"
why is it the norm in the linux community to handicap new users with this crud rather than help them out with actual working example commands? I could KNOW forevermore where to point to for wine and winetricks if I just saw it in the command I'd be like "oh so that's where it is!" but instead here I am and it's helpful for noone. I'm assuming you were trying to reply to me? In general, if you wish to know where a certain program is located, you can find it with the command "which". So, "which wine" will tell you something like "/usr/bin/wine". Furthermore, "/usr/bin/wine --version" will tell you that the wine package provided by Ubuntu is too old (likely 1.6.2) and (as per tutorial) you'll need to get a more recent version. My commands wouldn't help you at all because you wouldn't have those files anyway. So, the "/path/to/wine" is there because the system version isn't going to work and you should point this to your own wine binary, either downloaded from somewhere or compiled by yourself. One way to get a more recent wine binary is to install PlayOnLinux and install one through their GUI. It will be saved in "/home/user/.PlayOnLinux/wine/linux-x86/1.9.22/bin/wine" or something similar. Wineprefix is basically the "windows install" in which you want to run your program. If you leave it out the default one will be used which will probably be okay. If you need anything more you can usually find it on wine wiki, google, or by asking nicely. Oh, and now I saw you already figured it out lower. Welp, let this stay here for anyone else with those problems. Both will tell you the path..
@Andrew Noble you should not rage on people to not knowing basics. Everybody started somewhere and I am sure that there was a period in which even you, the self-proclaimed guru, didn't know whereis, which, env or stat. Your comment did not help nor did it boost your "super-guru appearance" in the community. If you don't have anything constructive or helpful to add - just don't say anything. Please keep your tone normal and respectful. I will not allow such attitude towards people asking questions. Get a recent version of wine, you'll need it to support vcredist2015. PoL's 1.9.22 did it for me, staging seems to be okay too. Get a recent version of winetricks (the ones that come with PlayOnLinux are too old) and install vcredist2015. I also installed vcredist2013, not sure it's even needed. Make sure to run the right program! The standard launcher won't do the trick. Either run "LeagueClient.exe" from the command line or create a shortcut to it in PlayOnLinux, it's the one with the new icon. Or you can add --no-sandbox in PlayOnLinux GUI under Arguments. If it still doesn't work - run it from terminal as written above and look at the output! Search for "err" tags, those are the problematic ones, if you fix them it will likely work. This finally made the launcher load up for me. If you find any other err tags google them, look for a solution, fixing them should fix the launcher. Check the terminal output for any "err:" messages and try to get rid of them. If there aren't any, try adding "2>/dev/null" to the run command (so after --no-sandbox) to get rid of debugging output. Curious as it is, I just noticed it bugsplats for me too unless I add that or run it from PoL. so that got me much further I the patcher launches albeit the window is black i clicked on what the play button wourld be but then the wine program error showed up. How do you run it through playonlinux if it wasn't created via play on linux? Nevermind I figured out how to run it via Pol as well but no version of wine I try has any success. I imagine windows 7 is the safest bet. are there any "staging" options I should be trying? I used Windows XP setting, try that one. As for staging, once you get it to work, CSMT might give you better performance, it seems to help with FPS drops for me. I tried that I get wine program error. Well, then I guess it's back to debugging. You said the furthest you got was a black window when you ran it with 2>/dev/null, right? It sounds like the exact problem I had before I solved the err: messages (which were probably caused by wine from PoL in the first place). You can try and do the two fixes i mentioned in tutorial, but if you wanna see what exactly is wrong then try redirecting the errors into a file (2>/home/user/winelog.txt) and looking through it. It should still start the same way as with redirect to null, but all debugging info will go into that file. Then when it crashes (if it does) look through the file for lines starting with err:. Google them, if that gets you nowhere post them here (but please, not the entire output, just those lines). Another possibility is that you just gotta try starting it a few times. It sometimes takes two tries for it to start properly for me (though the first one drops no error dialogs, just never opens). In between the tries you can simply clear all wine processes with "pkill wine. * && pkill . *\.exe"
I'm using 32bit prefix and have installed d3dx9, vcrun2013, vcrun2015 in there. I can confirm the same symptoms, launching the game with stderr redirection 2>/dev/null it will start almost every time, sometimes it will hang or bugsplat, but then on the next try will work again. When launching it without the redirection, i get "wine: Unhandled exception" and a window with bugtrace or riot's bugsplat (or both together) but it will never start. What executable are you trying to open? LeagueClient.exe for the current beta. If you want to play beta client start LeagueClient.exe. If you try to play the legacy from lol.launcher it doesn't work. You should have to open LeagueCLient.exe and look in the right part to launch Legacy client. I made the update to the Beta Client and now when I press the Start button it's doing nothing. How can I fix this? I have the same problem. I installed vcrun2015 and some other packages but still get errors. Can someone post plz complete manual how to run it. Thank you. I installed all that needed from the other subjects but I still can't start it. Since patch 6.22 no matter what wine version I chose or how many times I reinstall LoL upon lauching the game I get infite bugsplats. Debug mode does not yield anny errors, only warnings telling me to consider using noveau drivers, but I do not think thats the case. Im using manjaro 16 with proprietary nvidia drivers (gt 755m). Not saying there aren't other possible issues, but the only one I'm aware of at the moment which causes bugsplats on startup would be the new beta client, which is currently only available on the Oceania server. Regular 6.22 works fine for me on Arch, also using the proprietary NVIDIA drivers. Try 1.9.13 + staging. It works well for me on Gentoo. There was a regression in some of the newer version but I believe it may be fixed now.. I get the same problem exactly. For any with problems trying to open the new beta client, I need to install the vcredist 2015 libraries with winetricks like api-ms-win-crt-math-l1-1-0 (native, builtin) plus msvcp140 and ucrtbase and now works using --no-sandbox argument on recent development wine (1.9.22 on my case). I tested the new client using both new prefix on PlayOnLinux and system wine-development (i'm using Debian Sid atm). Both with default configuration (OS setting to XP), 32 bits. -I have to open the client like 5 times. 4 of 5 times crashes with bugsplat but sometimes not. I don't know why this happens. I killed dead processes every time it crashes and then tried to reopen LeagueClient.exe. -Its important to pass the '--no-sandbox' argument. -the winetricks dlls are needed to work. If a blue window appears and then crashes with the big loading circle you should see the console log and check if you have all the dlls I described to the first comment. -I tested it using the i965 Intel drive (i7-4770 processor) but I think it works at least on nVidia propietary drivers (don't know in AMD sorry). -The first time you open the new client you may wait for upgrade. It does not show any window but uses a considerable internet bandwidth. Correction: I used winecfg, not winetricks for install vcredist2015 libraries. I managed to get it started overriding the libraries you listed in a clean 32 bit prefix (second time I tried, the first time I got bugsplat and wine errors). Now it is upgrading (in a visible window, yay!) and I didn't try to close it and reopen it yet. Hi, can you provide a string, i.e. how i pass --no-sandbox to launcher? Note that the beta executable is LeagueClient. lol.launcher is the legacy executable and does not need to pass this argument. since the new client is based on the chromium browser for the store and not Microsoft IE like the old one. I also had a msvcp120 error leading to bugsplat. So, I installed LoL via PlayOnLinux, and I can't seem to find vcredist2015 in the components, vcrun2013 being the most recent version there. PlayOnLinux doesn't have updated winetricks to be able to install vcredist 2015. A) Use a updated winetricks version from your OS and not the POL version (I haven't checked if it works). Then go to Libraries and add form list the following libraries as (native, builtin) in "New overrride for library:"
* Indicates all libraries that start with that. They are about 10, although they may not all be needed. I've now managed to do that using a different version of winetricks, as you told me, but msvcp140 is not shown here for some reason. Oh my gosh, I checked the logs and saw that it had issues with vcruntime140. I added that one, changed the shortcut (which I forgot the other times I tried) and it seems to work now. Thanks, man! I bought a AMD RX 470 Nitro+ 8GB and running it on Arch with the latest packages and open source AMDGPU Driver. With wine I got really poor performance: max fps are 50 and the longer the game last I will get less fps, under 20 fps is no rarity, regardless of the graphics settings. For comparison in windows 7 I get between 150-200 fps. CSMT is enabled, if I enabled OpenGL I will get blurry textures. I don't even know if that is a specific wine problem or general graphics problem. Anyone experiences or tips? Make sure you are running latest linux kernel, mesa version, and amdgpu version. This usually benefits GCN1.2+ cards on open-source AMDGPU driver. Another tip: Have you used gallium-nine patched wine yet? It is one of the greatest benefits of using the open-source driver, being able to use directx9 natively with gallium. With Gallium-nine enabled(you need to make sure the game you are playing supports dx9 and uses it), you can get higher framerates, better frametimes, and lower cpu-usage, and higher gpu usage. If anyone is wanting to test out the client update alpha, there is a download link in the support FAQ. That installer will add the alpha client to your existing league of legends installation (it will refuse to install if you don't have league already). If you have not yet been accepted into the alpha test, you can still download the installer and have it download its files, but probably can't log in. It currently crashes before having a chance to log in for me. Testing on my linux machine, the installer runs fine, but when opening the new client it hangs before showing any kind of window. The logs show "000006.231| ERROR| Remoting| HTTP Response 404 to POST '/performance/v1/process/63'"
This seems to mean that it's using the Chromium Embedded Framework, and I could not get it to run with Windows XP, Vista, or 7, and couldn't find an easy way to add a --no-sandbox argument. Testing on a windows computer gives a window that appears to be downloading an update, but that window doesn't show up on wine. I am running wine-staging 1.9.19 on Arch Linux from the repositories. After I updated to the new patch (6.20) in league of legends when I logged in, the game immediately crashed (bugsplat) without me doing anything. I couldn't even make it to champion selection. So, I decided to uninstall and re-install the game but now the installer crashes too (bugsplat) and I can't install it. It always happens when it's about 42-43% done at the second step and I have no idea how to fix this. Thank you in advance! You can use the old LOL-installer; it is still working! By the way, the script should work too. I tried on the latest wine, 1.9.13-staging (as suggested) and some other versions, but the installer crashes at the actual installation step. Run the installer on wine with debug enabled and let's see the output. In other words, how do i properly run the debugger? but this produces way too much output even before the actual installation process has commenced. I know the first number is the Byte equivalent of 512M and probably the others are sizes too. > Access the libraries tab, find in the list of existing libraries (or add a new entry for it if it does not exist) dnsapi, click Edit... and configure it for "Native then Builtin"
I looked it up for like 5 mins and such an error pops up both in native Windows forums *and* WINE forums. Since 1.9.14 the d3dcompiler_43 native is needed, which causes huge degradation in performance. Until this is fixed i suggest using 1.9.13-staging with CSMT enabled which give performance comparable with Windows levels. Hi, im new in ubuntu and i want to know what do you mean by a clean prefix? Hi all. I'm wondering how you've gotten the game-menu shop to the work (not the in-game shop, but the shop for champions/skins/runes prior to match-making). I am running Debian Sid (amd64), and have wine32-development installed (wine-1.9.17 (Debian 1.9.17-1)). Do I need to use a WINEARCH= or WINEPREFIX= (for the i386/win32 specific-arch?) w/ LoL, or can I just run `wine ...`? A workaround for the RP/IP shop not working is to go to your champions list in your profile and click on a champion that you don't currently own, then go to the store. I can't figure out who originally found this and posted it, but someone deserves thanks and credit! I want to follow-up to my inquiry and your response. First, I deleted the Wine prefix that I was having trouble w/ and created a fresh one, installing vcrun2005, ie8, corefonts, adobeair, d3dx9, and setting the version to Windows Vista. I then copied C:\Riot Games\ from a Windows installation where the game+shop all worked to my new wine prefix. With this new setup, _everything_ seems to work great! The menu-store, in-game shop, login timeouts. Of note, w/ the old prefix, the "get to store by champion list" trick never worked for me. Sometimes I _could_ buy the champ from the champ details screens, but usually it would say "Unavailable" on the button to buy (As though the data request to get the store info never worked). 1) sometimes, the launcher/menu will have a very bad render glitch, where it starts to draw everything offset from the actual edges of the window. It usually does this when my cursor is moving over e.g. a button or the edge of the window. It seems to happen randomly, but once it happens it continues to happen repeatedly. Making the window full screen keeps it from continuing, but cuts off a lot of the UI. Similarly, resizing the window fixes it, but using the cursor quickly breaks it again. this would happen w/ the old prefix and older version of Wine too. 2) When in-game, switching to different workspaces (I use i3 as my window manager) and back to the game usually means I have to kill the game and re-start; I get a black screen and sometimes the game dies. this seems to only happen w/ the new prefix. I've tried both with a copy of fresh installation from Windows and a fresh install using LeageOfLegendsBaseNA.exe, but both would end in a BugSplat. I'm using win32 and tried various OS config starting from XP with the same result. I figured it out: I needed to install corefonts and set OS to Vista. It does not work on winehq-devel otherwise. Hey, it really seems to work, i am just stuck at the login. that there seems to be no connection to the login servers. I played before the last LoL patch just perfectly fine with the same installation. I really appreciate every help on my problems! Try wine 1.9.15 stable release. Try installing IE 9/10 components in the same virtual drive. At the end try reinstalling the game. Sometimes on rolling-release distributions some dependencies cease to be satisfied after an update. So I given up last time on this error, but recently I found on forums that if You remove wininet override it works. Works for me, hopefuly it works for You. Cheers! Shop is working for me in Wine 1.9.15 fine! Till 1.9.14 it does not. May also because of the new LoL-Patch. Hi... Can you tell me how you do that?... Like a step by step commands?... Thanks! It works for me on clean wine-gaming-nine 1.9.13 from aur . In xp prefix starting with "--no-sandbox". It doesn't work unless i pass that argument. Which binary do you run? You typed it wrongly perhaps, shouldn't it be "-no-sandbox" ?? It's "--no-sanbox" and it does get passed to LeagueClientUx.exe (check the log). Also you need to set windows mode to Windows 7. I'm still unable to start it, even on the clean prefix. Every argument gets passed to LeagueClientUx.exe no matter what you give. I'm on Archlinux system and I used pacman to install wine. I tried removing wininet but to no avail. Anyone has a solution? I tried reinstalling wine via pacman, but it still doesn't work. In addition to this, I cannot purchase RP or access the store, the home is always black. Hi guys, when I change the screen resolution (while in-game), the game crashes. Do you guys also have this problem ? Might not be the best solution, but installing the game anew in a fresh prefix fixed this issue for me. Running Arch Linux 64 bit, Wine 1.9.10. nvidia driver from official arch repository on GeForce GTX660. Maybe you can have some missing components. I remember having a lot of troubles trying to find the good combinations of components to install with winetricks. Did you just install the game with wine without any extra component added with winetricks ? If it is the case it won't work. If yes, what components did you add ? I have seen this with wine's windows version set to Windows 7. With wine's version set to Windows Vista things worked again. See the comment thread from May 8th for more info. I sometimes also have this problem. (but only sometimes, lik in champion selection). My workaround is to click on the "-" to reduce the window, and then taking it back and it becomes normal again. If you still have this problem you should fill a new bug on wine bugzilla. Can some of you shop in the new shop that came up recently ? When I try to buy runes, I have a first error about the certificate not trusted, then when I access the rune shop and try to buy something (for example runes), it asks for my login and user and can't login to buy anything, with "an unknow error has occured"
Am I the only one to have this error ? I get the same certificate not trusted error, but immediately when I log in to the game (not when I go to the shop). If I decline the certificate, then when I go to the shop I get the dialog asking for a username and password, and the shop does not work. If I accept the certificate, I do not get a username/password dialog, and the shop works properly. Just updated to 1.9.10, still don't work. Tonight when trying to start lol, I was getting a crash in LoLPatcher.exe. Changing my reported windows version from Windows XP to Windows 7 made the crash go away, but the launcher window was just a black box. Changing the windows version to Windows Vista made things work. Oops, changing version to Vista made the launcher work, but the login window is mostly black, with just window borders showing. Also, when the version is 7 and the launcher window is completely black, I can click where the login button should be and it loads the mostly-black login window. I deleted my wineprefix and reinstalled, and with windows version set to Vista things work again. With windows version set to XP I still get a crash in LoLPatcher.exe, but as I said before they're dropping support for XP anyway. I haven't tried 7 since I got it working. For reference, I have wine patched with the texture allocation patch from bugs.winehq.org/show_bug.cgi?id=34480#c19, I used a 64-bit wineprefix, I had the windows version set to Vista, I used winetricks to install corefonts, vcrun2008, and d3dx9, and I used the old LeagueOfLegendsBaseNA.exe to install. I start to experience crashing too. But Changing OS option to Win 7 or Vista only making things worse. Was trying to run older version of client, and after update it has the same error. A little note: I actually have crash in LolClient.exe after logging in. It was appear time to time for me. I`m not sure should we create a bug to commit upstream? Can you please explain how do I apply this patch? Or specify where can I find the specific wininet.h should I modify, because I tried manually editing three of them and got same result. ir_client/releases/0.0.1.215/deploy//LolClient.exe: cookie.c:584: get_cookie: Assertion `len+1 < 2048' failed. @dolphinling @Oleg can you try running it with debug output and providing the output here. We cannot guess what's wrong. If you run the launcher in a console you will get some errors printed. This kind of thing happens a lot with LoL. It could be a lot of things: Bug in wine, Bug in LoL (Linux specific), New feature from LoL we don't know of, etc. Let us see some errors. Change back your windows version to XP. Are you using playonlinux wine version (if you do did you install all wine dependencies)? If you are not using wine-staging did you install corefonts overide? Thank you for your test results. I will reinstall wine, create a new wine prefix and will try to run the game as you described. I randomly experience that LoL stops responding to mouse clicks in the new draft pick mode. Workaround: Resize the window in the lower right corner (make it a bit smaller, not bigger, otherwise it will be drawn incorrectly when the game is finished). Don't use playonlinux script, please!!! That is script is 3 years outdated. It uses a lot of overides and what not while the game itself works without overides. Install in stagging prefix with no overides. At maximum you should install d3d9x_36 for directX if you are NOT planing to use openGL. If you are planing to use openGL DO NOT install it. Also you might need corefonts. Again DO NOT, i repeat DO NOT install it if you will be using openGL. The last overide that might help is vcrun2008 and only install it if you can't get launcher to start (non-staging wine only???). Any of internet native overides can only BRAKE your lol instalation. I will post again when i try newer wine version. Just remmeber to not install overides before actualy verifying you need them. I regullary update my own Script for LoL, on my GitHub. Thats just you, many people just go with what they read first. Because nobody complains and if they complain they pretty much ignore it with excuse that "they need to support legacy installations". All in all its project with very few people and they don't have enough manpower to update every script. I use the last one today to setup League of Legends on Arch x64, it works pretty well out of the box. All they did was bump wine version a little and changed the date. 1.They use old setups which reauire winver workaround and need to be ran. New setups can be extracted. Too old patched wine version. Wine 1.9.9 has proper bugfix. 8. PlayOnLinux wine versions don't allways play nice with rolling release distros. Not really the point here but related to issue above. I'm using your script and I have removed the d3dx9_36 override to see what happens. It is running. I'm on Debian Jessie with backported MESA running on integrated HD3000 Intel from a i5-2410m. That means the game runs in OpenGL for me so I don't require the DX packages? Who needs the DX packages though? People on NVidia and ATI drivers? Since my system is not enough for quality gameplay I'm doing everything I can to increase FPS so I'm wondering if running it in OpenGL mode will make me lose performance or something. The game is crashing everytime at 47% while updating. it start over and over after the crash. Not confirmed for LMint 17.3, still all is working using OpenGL. 1) Start LoL and log in. 2) Go to the “Champions” tab in your profile and click on a champion you don’t own. You should see its price in the lower right corner. 3) Go to the store. On another system, step two actually started causing the problem which should be fixed. So on that system, starting LoL and then opening the store immediately works. For me too, till May I couldn't fix it. In the air client (Login and chat) the keyboard layout is correct. When the game starts, the keyboard layout is English (US). The kayboard map is switched to french ingame correctly. IDK what's the magic behind this, but it is tested and works. 6.3 patch seems does not finish cause of very high disk activity while patcher is trying to patch whole bunch of provided images files changing their format to a whole new somehow. I cant see work around but launcher just crashes while patcher doing these 6.3 patch upgrading procedure and then bug splat reappears. If someone can overlook these script www.playonlinux.com/en/app-1135-League_Of_Legends.html I've use and give some advice or tips to what I have to change give a shout please. For now I am going to give up on these or wait until new client beta starts in next year. You dont need to install any overides except d3dx9_36 and corefonts with new wine releases. If you are running x3d_platform DO NOT install corefonts as it breaks opengl mode detection for some reason. Just installed LoL with wine 1.8, patching takes ages but works. As Translator5 describes in appdb.winehq.org/objectManager.php?sClass=version&iId=33303 the game has a problem when opening the ingame shop. First the game just froze. After installing corefonts, vcrun2005, vcrun2008, d3dx9 with winetricks (dnsapi wasn't found) the game crashes to desktop, when opening the ingame shop. But after applying TuXLoL bitbucket.org/Xargoth/tuxlol/wiki/Home (tuxlol-0.1-dd62ba8-bin.tar.gz) it works.